In previous articles we discussed "Common Back Pain" which represents 95% of back pain. We also discussed "Herniated Discs" which are responsible for less than 5% of back conditions. In this article we’ll look at a couple of other conditions that can cause back pain. 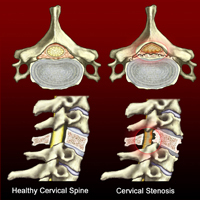 Spinal stenosis is the build up of arthritic bone growth and "wear and tear" of your spinal canal. This is where your spinal cord and nerves pass through. Thus those arthritic bone growths can impinge on your nerves and cause pain. They also change your joint surfaces. This means that you may not have full movement as a result of those changes. You will typically be 60 years of age or older if you have this condition. If your symptoms are severe, then your doctor may refer you for surgery. Ankylosing spondylitis affects the joints of the spine and pelvis. They become rigid and may even fuse. This is a hereditary condition. If you have this condition, then you will typically be a young adult male. You have pain and stiffness in the morning. This may also radiate down into your spine and legs. This diagnosis can be confirmed with a blood test. Although there is no quick-fix for this condition, it is best managed with a combination of medication and physical therapy. Bear in mind that the incidence of these two conditions is quite low in back pain patients. If you are suffering from back pain, its very likely that that it is common back pain, which responds very well to treatment. At the Pain Relief Clinic, our physical therapy approach consistently brings resolution to painful conditions and sport’s related injuries. Our treatment is successful treating acute injuries/painful flare-ups and also when confronting chronic long-standing and persistent conditions. During your initial visit, we will take your full case history and also assess your painful condition or injury. Once we have identified the primary cause of your painful condition or injury we will approach this by treating the appropriate area. Your treatment is usually done through light clothing and is primarily a hands-on approach. Your session involves the application of pressure to muscles that have been established as being problematic to return your muscle tissue to a healthy state. The pressure applied can vary from light to deep pressure. However, client comfort is the most important aspect and the amount of pressure utilised is dictated by your age and suitability. For example, the degree of pressure utilised on an elderly client would be far less than the pressure used on a strong rugby player in his twenties. In addition, some light work may also be carried out on your joints if necessary. You may also be given some home-care advice to help your recovery. "I have been attending Tony for quite a few years anytime my back pain flares up, and get immediate relief and after a couple of sessions would be back to normal again. 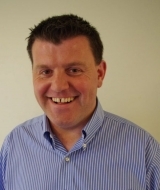 Before finding Tony I had been to many different therapists and was fed up trying to get some relief from my back pain, however since attending the Pain Relief Clinic I have never looked back, I cannot recommend him highly enough." The Pain Relief Clinic is situated above O’Sullivan’s Pharmacy in O’Connell Avenue in Limerick City Centre with street parking adjacent. You have a choice of morning, afternoon and late evening visits. Hi, my name is Tony Phelan & I’m a Registered Physical Therapist. I go to the US annually for update courses, which ensures that you avail from some of the best physical therapy treatments practiced in the world today in our Limerick City practice. Your session is also covered by VHI, LAYA (formerly Quinn Healthcare), Hibernian Health Aviva and GloHealth. Your treatment also qualifies for MED-1 Form refund. Take the first step towards effectively treating your painful condition/injury by phoning us today to schedule your appointment in Limerick City on (061)467940 or (087)6250992. We look forward to hearing from you and I hope that you enjoyed the article.